It would be an understatement to say the world was rocked by the Tate-LaBianca murders in 1969, which were orchestrated by Charles Manson. Decades later, we still can’t stop talking about the murders or Manson himself, and countless movies over the years have derived inspiration from the horrific acts his followers carried out. For his latest, Anthony DiBlasi takes those real-life horrors to the next level. Co-written by DiBlasi and Scott Poiley, Last Shift centers on Jessica Loren, a rookie cop whose first shift is the final one at a defunct police station. It’s not long before strange happenings shatter the quiet of the night, as she receives mysterious phone calls and is tormented by a seemingly confused homeless man. As Jessica begins discovering the secrets of the station, she is plunged deep into an abyss of terror. It’s always impressive to see how much a filmmaker can do with very little at his disposal, and Last Shift is one of those wonderfully contained films that does a whole lot with the set-up of a single character isolated in one location. A low-budget affair that doesn’t feel like one, Anthony DiBlasi’s fourth feature is rich with its own mythology, and he pulls an impressive amount of story out of the confined premise. We’ve all experienced first days, whether they’re first days of school or first days on the job, and DiBlasi captures that sense of foreign unease in the early going. Jessica is on edge and out of sorts right off the bat, and her anxiety about the whole situation – even before anything really happens – is very much felt. So too, thanks to a solid performance from Juliana Harkavy, is her fear and determination to overcome it. Though other characters briefly come and go, Jessica is the main focal point, and Harkavy brings an almost effortless authenticity and likability to the role. Despite very little interaction with other actors, she informs us exactly who Jessica is and what drives her to make every move she makes, giving us a keen understanding of a character who doesn’t do much other than talk to herself and walk around in the dark. What makes the film work so well is the fact that not only is Jessica alone but she’s truly on her own, as every other character seems to be working against her. And because she’s so determined to prove that she can handle the job, it makes sense within the context of her own mind that she doesn’t ever head for the hills. She’s trapped and nobody is coming to save her, which really adds to the suspense of the situation. It would be impossible to not compare Last Shift to John Carpenter’s Assault on Precinct 13, as the films share a good deal of common ground, but it’s the Hellraiser-inspired horror DiBlasi adds to the mix that really makes this one a standout indie offering. It should come as no surprise to anyone who watches his latest effort that DiBlasi directed a Clive Barker adaptation (Dread) in the past, and that influence is felt. 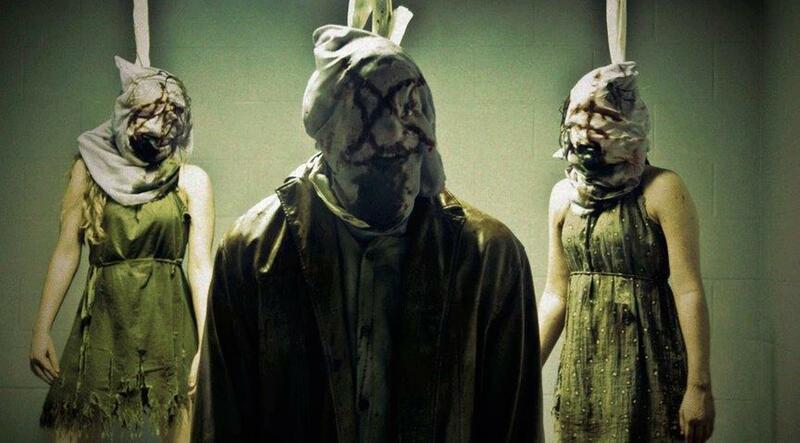 Coming off like a virtual funhouse walkthrough, Last Shift is loaded with hellish horrors, and the film is at its best when we’re as confused about what’s going on as Jessica is. It takes a while before exposition clues us in to what’s happening, and even then we’re never quite sure if what we’re seeing is real or a supernaturally-induced figment of the character’s imagination. And things tend to get pretty damn creepy. Once the atmosphere is thick with dread and the proceedings suitably tense, DiBlasi assaults the senses with all sorts of nightmarish happenings, and some of this year’s most memorably frightening imagery can be found within the walls of Last Shift‘s insanely haunted police station. Though at times you’re likely to be reminded of other films, that rarely makes the various thrills and chills any less effective. In so many words, Last Shift is nothing short of a waking nightmare. It’s a genuinely unnerving film that’s anchored by a great character and driven by an engrossing story, and though the finish is relatively weak and unsatisfying, it mostly fires on all the right cylinders throughout. This one is more about the journey than the destination, and Jessica’s dreadful night of horrors makes for a fun night of viewing. Tags: Anthony DiBlasi, Last Shift, Movies, Netflix, Netflix Instant, Reviews, To Stream or Not to Stream?